Zentangle 4 has 40 tangles with step-by-step instructions including Paradox and a “Shell Variation” so there are 38 fun new tangle patterns for you to learn. The book is the same size and format as the previous three titles (Zentangle Basics , Zentangle 2 , Zentangle 3 ), 20 pages including covers and measuring 8.5″ x 11″. As with Suzanne’s previous books, you can give this one as a gift to Zentangle newbies because the book begins with the basic instructions for getting started and suggestions for supplies and tips for shading. If you are anything at all like me, you love browsing your local art supply store. 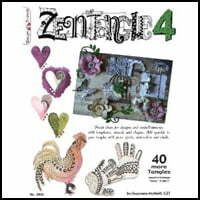 And Zentangle 4 is the book to show you how to put into use many of those items that jump into your shopping basket. Suzanne includes ideas for using stickers, templates of all types, stencils, while gel pens, glitter glue, watercolors and watercolor pencils, chalk, and metallic and gel pens. There a lots of illustrations and ideas for adding color to tangles, embellish scrapbook and art journal pages, collage on canvas, and creating greeting cards. Zentangle 4 is another worthy addition to your Zentangle library with its fun new tangles and fresh ideas to stretch your creativity.